In time for the release of the HD remake, and ahead of the 25th anniversary of the original release, we’ve ported the SNES classic Secret of Mana to tabletop format! That’s right, the wait is over and the latest GameCola PorTable RPGCast is here! 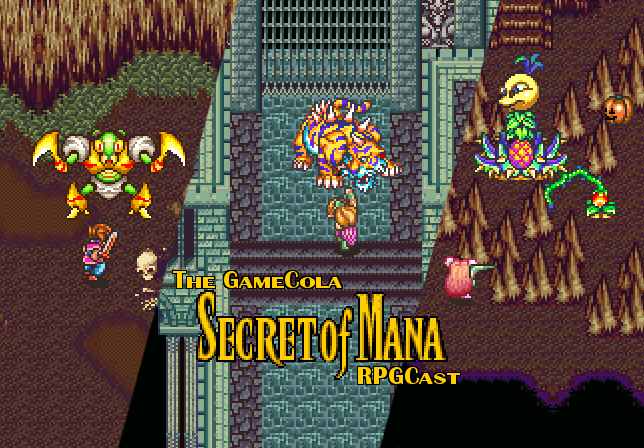 Join Alex “Jeddy” Jedraszczak as he guides James “Valor” Pelster, Anna “Harper” Bryniarski, and Joseph “I Think I Have Amnesia” Martin through Secret of Mana, customized around three players and based vaguely off of D&D 5e rules. This first episode is an extra, extra long three-part session leading each party member to the Water Palace. There’s adventure and exploration! There are battles and boss fights! There’s book theft and questionable eating decisions! All the great things you’d expect from a tabletop version of Secret of Mana. Considering the nearly two-hour length of the episode, I’ll stop talking and let you get to it. But if you find yourself wanting more after the end and you just can’t wait for the next episode, be sure to check out our other RPGCasts—some videogame related and some not so much—or any of our other content! And be sure to Tweeter about the #GCRPGCast! Don’t have the time to listen now? You can always find us on iTunes and listen when it’s convenient! This is VERY good content and I look forward to seeing what Joe tries to eat next!! "Rivers! Enrique! New plan! Forget revenge; we’ve got to escape my parents!"